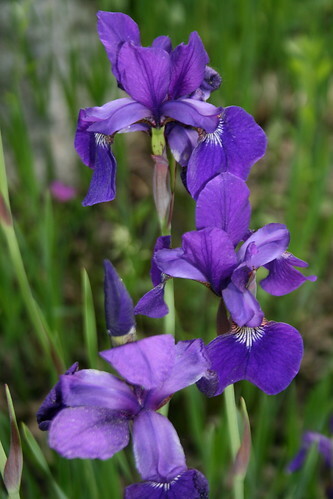 Irises are one of my favorite flowers, purple especially. I dug up some before we moved hoping to having a place to put them here. They ended up sitting around in a grocery bag for over a month. I don't think they're going to make it. I put them in the ground just to make sure. Last week when I looked in the flower garden in front of the porch I was trying to figure out what some of the flowers were. There were these tall skinny rods with a tight bud on top. I could tell they would probably be purple but the stem and leaves didn't look familiar. To my surprise they bloomed and are purple irises, a mini variety. There a lots of them which makes me happy. I thought I'd share some with you.